New Delhi: Telecom regulator Trai on Friday recommended allowing mobile telephony and Internet services for passengers during air travel in the country through both satellite and terrestrial network. 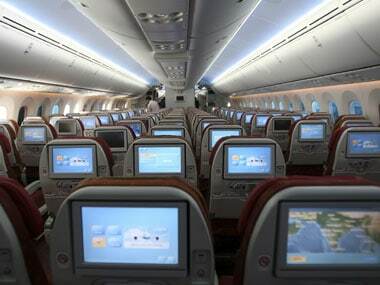 "The authority recommends that both, Internet and Mobile Communication on Aircraft (MCA) service should be permitted as In-Flight Connectivity (IFC) in the Indian airspace," Trai said in its recommendations on 'In-Flight Connectivity' (IFC). The Department of Telecom had sought views of the Telecom Regulatory Authority of India (Trai) on 10 August, 2017, over proposal to introduce voice, data and video services over Indian airspace for domestic, international and overflying flights in Indian air space. "The operation of MCA services should be permitted with minimum height restriction of 3000 meters in Indian airspace for its compatibility with terrestrial mobile networks," Trai recommended. The regulator said that Internet services through Wi-Fi onboard should be made available when electronic devices are permitted to be used only in-flight or airplane mode and announcement regarding this should be made after boarding is completed and the aircraft is about to taxi. "It would ensure that there is no encroachment on the scope of terrestrial Internet service provided by telecom service providers as well as practically there won't be any appreciable discontinuity in the provisioning of Internet services to the fliers," Trai said. The regulator recommended creation of an IFC Service Provider for IFC services at annual licence fee of Re 1 only initially, after entering into an arrangement with telecom licence holder having appropriate authorisation. airspace. Therefore, the onboard Internet traffic must be routed to a Satellite Gateway on Indian soil," Trai recommended. It added that routing of traffic through satellite gateway in India should be imposed regardless of whether the satellite in question is an Indian satellite system or not.